Congress instructed the Army Corps of Engineers to dispatch an Engineer Officer to Manistee to conduct a survey of the river entrance in 1861. 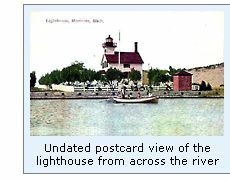 While the Engineering report indicated that harbor improvements at Manistee were both necessary and valid, nothing would be done until 1867 when appropriations were simultaneously approved for improvements to the river entrance and for the erection of a lighthouse to guide vessels into the new entry on its completion. Improvements began in July 1867 under the direction of Mr. John Canfield, and that same year, a survey party was sent to Manistee to select and survey a site on the north shore of the river mouth for the new lighthouse reservation. Work on the new station began in 1869 with the excavation of a cellar and the erection of a rubble stone foundation. Atop this foundation, a wood-framed dwelling with an integrated tower was erected, and outfitted with a Fifth Order lens. With expected completion close at hand, Octavius W Barney was appointed as the station’s first Keeper, reporting for duty at Manistee on December 30, 1869, when work was suspended with the arrival of winter. 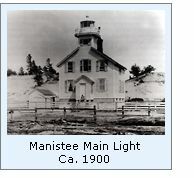 Although considerable work remained to be completed at the station, work on the tower had progressed to the point that Barney was able to exhibit the new Manistee light on the opening of the 1870 navigation season. As construction continued through the spring, it was discovered that the building had been mistakenly erected too close to the rear of the reservation, and that a small addition at the rear of the dwelling was located beyond the surveyed reservation. Work was temporarily suspended until arrangements were made to purchase additional land at the rear of the reservation for the princely sum of $30.00. Work on the new station finally came to a close in July 1870. The construction crew departed, leaving Barney to tend the light alone. Barney resigned his position as Keeper of the Manistee Light on April 24, 1871, and was replaced by John McKee. 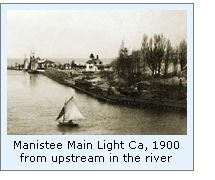 Manistee of 1871 was a flurry of activity with river entry and harbor improvements well underway, and the mouth of the river now accessible to the largest vessels. 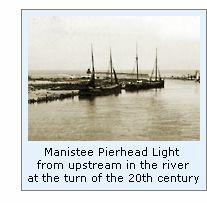 The river was being opened-up deep into the heartland, and with the new lighthouse serving as an excellent guide to the increasing volume of vessels entering the bustling harbor, the residents of Manistee sensed their town was poised for greatness. Then on October 8, 1871, all Hell broke loose. A huge fire, which had been sweeping through the area forests finally reached Manistee. Fed by the mountainous piles of lumber and shingles lining the river banks, the fire jumped the wooden bridge across the river, completely consuming the town on its inexorable push south. When the fire had passed, the entire town lay in smoldering ruins, including the lighthouse which had burned to the ground foundation. As the townsfolk tried to rescue the few remaining possessions of their former lives, Keeper McKee toiled for two days to establish a temporary light atop a pole near the lakeshore to serve until more permanent arrangements could be made. With the lighthouse a complete loss, Congress appropriated $10,000 for construction of a new light on May 18, 1872. Eleventh District Engineer Major Orlando Poe responded quickly, dispatching a work party and materials to Manistee that July, with the crew working at a feverish pace to complete the reconstruction. On completion, the new dwelling appears to have been a virtual duplicate of the original station, consisting of a 2-story wood structure with clapboard siding with an integral wooden tower at its lakeward gable end, and capped by an octagonal cast iron lantern. Since the original Fifth Order Fresnel lens had been destroyed in the fire, a new lens was ordered from Paris, and a temporary lens was displayed in the lantern on completion of the new station that September. The new lens was finally received at the Detroit depot late in 1873, and after shipment to Manistee, replaced the temporary lens in the lantern. 1874 and 1875 were exceptionally busy years for Manistee, with 3,488, vessels entering the river between June 30, 1874, and June 30, 1875. To serve this burgeoning maritime commerce, the piers were extended an additional 150 feet in 1875, and the channel between them dredged to a minimum depth of ten feet. With the main light now standing a considerable distance to the rear of the pierheads, the decision was made to replace the shore light on the north bank with a pierhead beacon on the outer end of the longer south pier. On establishment of the new south pierhead beacon on the night of October 15, 1875, the main light was discontinued, only three years after the station was rebuilt. While the structure no longer served as an active aid to navigation, it continued to serve as a dwelling for Keeper McKee, who was now forced to row across the river numerous times during each day and night to tend the pierhead light. However, McKee’s inconvenience was short-lived, as he was removed from his position on October 26, 1875 and William King appointed as his replacement. The volume of traffic along the coast heading to and from the Straits continued to increase, and in 1893 the decision was made to reactivate the main light to serve double duty as both a coast light and to better guide mariners to the river mouth. The futility of having the keepers simultaneously attend the reactivated main light on the north side of the river and the fog signal and the ranges on the south pier became clear, and the fog signal and pierhead light were relocated to the north pier in 1894. A new fixed white Fifth Order Fresnel lens exhibiting a red flash every 45 seconds was installed in the lantern on the Main Light, and the station officially reestablished on the night of June 18, 1894. The following year, 100 cubic yards of muck and clay were delivered and spread atop the sand on the main lighthouse grounds in order to provide a base for a lawn, and a rail fence was also erected around the edge of the reservation, completely enclosing the property. After recurring problems with the rotational mechanism on the main light, the light was temporarily extinguished from February 24 to March 5, 1902, while the District Lampist installed a new pedestal and ball bearings assembly beneath the lens. While on site, the Lampist also installed new improved Fifth order lamps in both the main and pierhead lights. 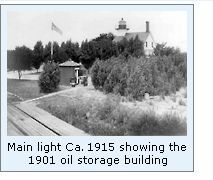 1906 saw the installation of 600 feet of concrete walkways connecting the buildings on the main lighthouse reservation. The fog signal building was removed from the north pier in 1927, and replaced by a 39 foot-tall iron tower on the outer end of the pier, and with the establishment of these new aids to navigation, the old Main Light was permanently extinguished and decommissioned. No longer serving any official government purpose, the lantern was removed from the structure and the building transferred into private ownership. With plans underway for the construction of the sprawling Harbor Village condominium complex in the area in 1993, the old building found itself smack-dab in the middle of the developing area, and the structure was lifted and moved to a residential area in town, where it sits to this day on West Melitzer Street at the end of Third Avenue, its original purpose virtually indistinguishable. Click Here to see a complete listing of all Manistee Light keepers compiled by Phyllis L. Tag of Great Lakes Lighthouse Research. The weather was perfect at Manistee. The sun burned-off the clouds, the breeze dropped to an almost imperceptible level, and the lake laid-down flat as a billiard table. We walked the pier, and looked at the catwalk, which runs the entire length of the pier. We wondered at how rough the weather must get in the fall and spring to require such a structure to be built. On a day such as this, it was difficult to think of this place as anything other than a peaceful place to walk! From US31, take Memorial Drive West approximately one mile to the Lake. Note that Memorial Drive changes to 5th Avenue along the way. Personal observation at Manistee, 09/05/1998.